For the love of music and coffee, Marcus Anderson created the perfect experience. 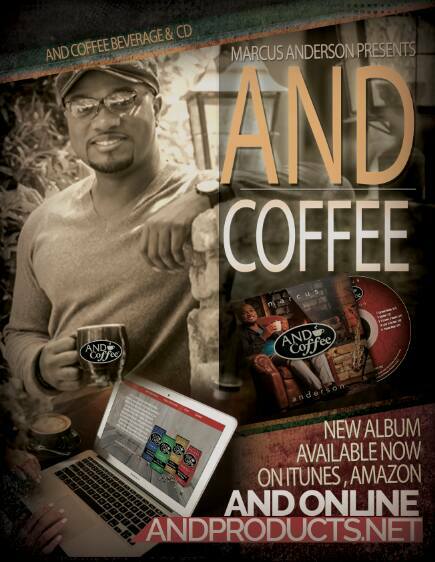 “AND Coffee” is not only a delight for music lovers but also aptly titled with a play on the saxophonist’s last name. The life of a musician is without a doubt hectic, and there is definitely a need at times for a quick pick-me-up. With that realization, Marcus started drinking coffee, and an idea was born. He developed his own brand of coffee, consisting of four flavors: Passion Blend, Cup of Joe, Hazelnut, and Cappuccino Strut. The collating new album “AND Coffee” is the perfect accompaniment to his coffee. Accordingly, every song on the album is titled synonymously with coffee. As with the different types of coffee, the songs on “AND Coffee” vary in style. Marcus featured his colleagues Nicholas Cole, Lin Rountree, Matt Marshak, Julian Vaughn, and SHOWCASE.